When you can’t get software on your computer to synchronize automatically with your Droid Bionic, you have to resort to doing a manual connection. Yes, it can be complex, but it’s often the only way to get some information out of the Droid Bionic and on to a computer, or vice versa. Connect the Droid Bionic to the computer by using the USB cable. Choose the USB Mass Storage option for the USB connection. Your Droid Bionic storage system mounts itself onto your computer’s storage system. Because the Droid Bionic can have two storage locations — internal and MicroSD card — two volumes may mount: MOT, which is the internal storage, and Removable Disk or NO NAME, which is the MicroSD card. 3a.On a PC, in the AutoPlay dialog box, choose the option Open Folder to View Files. The option might instead read Open Device to View Files. You see a folder window appear, which looks like any common folder in Windows. 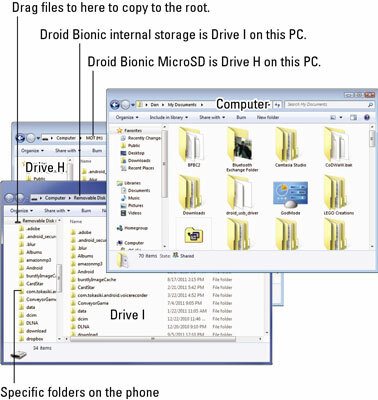 The difference is that the files and folders in this window are on the Droid Bionic, not on your computer. Use the second AutoPlay dialog box to repeat this process for the phone’s other storage (internal or MicroSD). 3b.On a Macintosh, open the removable drive icon(s) to access the phone’s storage. The Mac uses generic, removable drive icons to represent the Droid Bionic storage. If two icons appear, one is named MOT, which is the phone’s internal storage, and the second is named NO NAME, for the phone’s MicroSD card or removable storage. Open a folder window on your computer. It’s either the folder from which you’re copying files to the Droid Bionic or the folder that will receive files from the Droid Bionic — for example, the Documents folder. If you’re copying files from the phone to your computer, use the Pictures folder for pictures and videos and the Documents folder for everything else. Drag the file icons from one folder window to the other to copy them between the phone and computer. Use this figure as your guide. When you’re done, properly unmount the Droid Bionic storage from your computer’s storage system and disconnect the USB cable. You must eject the Droid Bionic storage icon(s) from the Macintosh computer before you can turn off USB storage on the phone. Any files you’ve copied to the phone are now stored on the Droid Bionic, either on the internal storage or on the MicroSD card. What you do with them next depends on the reasons you copied the files: to view pictures, use the Gallery; to import vCards, use the Contacts app; to listen to music, use the Music Player, for example. It doesn’t matter to which storage location you copy files — internal storage or MicroSD card (removable storage). It’s a good idea to use the MicroSD card because the phone seems to prioritize its internal storage and it can fill up quickly. Files you’ve downloaded on the Droid Bionic are stored in the download folder. Pictures and videos on the Droid Bionic are stored in the dcim/Camera folder. Music on the Droid Bionic is stored in the Music folder, organized by artist. If you don’t find the download, dcim/Camera, or Music folder on the phone’s internal storage, look for these folders on the MicroSD card (removable storage). Quite a few files can be found in the root folder, the main folder on the Droid Bionic’s MicroSD card, which you see when the phone is mounted into your computer’s storage system and you open its folder. A good understanding of basic file operations is necessary to get the most benefit from transferring files between your computer and the phone. These basic operations include copying, moving, renaming, and deleting. It also helps to be familiar with the concept of folders.